I love Korean cuisine. The mere mentioned of Korean cuisine immediately gets my adrenalin going at the thoughts of sizzling barbeque meats on grill pans, spicy Kimchi, assorted banchans, hot Kimchi soup and seafood pancake! In fact, I confess that I eat Korean food a few times a month. In addition, my neighborhood is filled with loads of Korean restaurants. Most of them offer the usual Korean cuisine but they all do have their own specialties. Gangnam 88 is one of the Korean restaurants I often patronized. While most Korean restaurants are more traditional, Gangnam 88 takes Korean cuisine into our modern world. Serving up Gangnam style dishes, Gangnam 88 also creates a modern design restaurant focusing on all the famous Korean pop stars in the entertainment world. Walking into Gangnam 88, one will be immediately attracted to stylish interior filled with lots of wood. Posters of K-Pop stars are placed all over while hanging tvs are playing Korean music videos. Its loud, its fun and best of all, the place sure smells pretty delicious! Gangnam 88’s menu offers a good sizeable variety of Korean dishes to cater to everyone. Besides traditional BBQ dishes, Gangnam 88 also offers unique dishes that are a take on the modern cuisine of today’s times in Korea. A recent visit to Gangnam 88 at their second outlet in Sunway Giza Mall, I was happy to see that this outlet has a larger seating capacity and is also very spacious. The walls are all decked out in K-Pop stars with the most famous one Mr. PSY that literally took the word Gangnam to new heights. We didn’t go our usual menu route that evening. Instead we opted for dishes we usually don’t order on the recommendation of the owner. Since I love Kimchi so much, we decided on a Kimchi stew and more kimchi dishes that are perfect for a rainy night. I had Korean citrus Soda and my other half had Milkshake. Our banchans arrived, served on colorful plates. Though the choices are not as many as others, these were decent. I got my favorite Kimchi and Seaweed. My little one loved the egg coated tofu, little pancakes and the sausage with crab stick banchan. These are refillable so ask for more but remember to save room for your main dishes. Kimchi Pork Roll Soup (RM44.80+) was first to arrive. I really like that Koreans serve all their soups and stews piping hot or on the portable stove. This one resembles the kimchi ji gae which I love but has added ingredients like cabbage stuffed pork roll, sliced pork belly, mung bean noodles, king mushrooms, spring onions and chilies in addition to the usual kimchi and tofu. We let the pot simmer till its boiling and then lower the heat to let it subside to a gentle simmer. The staff helped us cut the cabbage rolls into two for easier enjoyment. Next, we had Tofu Kimchi (RM39.80+) which we were recommended to savor with the Makgeoli (RM25.00+). A mount of kimchi sautéed with pork is accompanied by long cuts of fresh tofu sprinkled with black sesame seeds. The kimchi pork has a robust and spicy note as well. The flavours are intense so the fresh tofu will ease down the spicy, sweet and savory flavours of the kimchi and pork. I had read somewhere that this is a famous Korean anju (drinking dish) hence that’s why we had our dish with the chilled Korean rice wine. We had a non-spicy dish of Carbonara Chicken (RM39.80+) for my little one. This fusion dish was a take on the classic Italian dish but this one has chicken and onions cooked in the carbonara cream sauce. Served on a sizzling platter to keep the creamy dish warm, its not too bad. It is very creamy and there is a touch of sweetness to the overall flavours. I like the chicken and onion combination with the cream. My little enjoyed this since he likes creamy sauce dishes. We also tried the Bap Burger (RM19.90), a seaweed rice burger stuffed with bits of meat and vegetables with a sweet and sour sauce. This one is yummy. Simple but I like the rice and seaweed together with all the rest of the ingredients. I had to order the Korean Potato Noodle Soup (forgot the price tag for this dish) for my little one because he prefers noodles over rice. This dish came in cloudy and hearty chicken stock broth with lots of vegetables, egg and a soft noodle made from potato flour. It’s simple but I really enjoy the noodles as it is so slippery smooth and soft. My little one likes this a lot too. Gangnam 88 strives to be different. The menu offers lots of fusion and trendy dishes like BBQ, Beer Can Chicken, Jeongol, Jokbal and other exciting dishes. 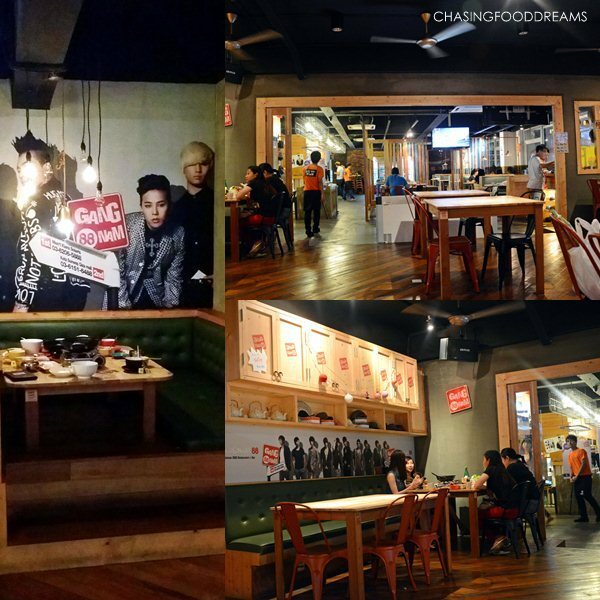 It’s a fun place to eat and be seen, especially if you are a Korean fan like me! Off Jalan Duta Kiara, Mont Kiara, 50480 Kuala Lumpur. The tofu kimchi really surprised me as I thought the combination is weird but both ingredients turned out work well together! Korean cuisine is amazing! I heard that they are cooking everything in best small deep fryer. It's amazing if it's true.